Few medications come without the potential for unwanted side effects. Sometimes those side effects are relatively rare or minor. Other times, those side effects, should they occur, may be so significant that they may outweigh the benefits the medication is supposed to provide. When it comes to hair loss medication, DHT blockers can pose just such a dilemma. 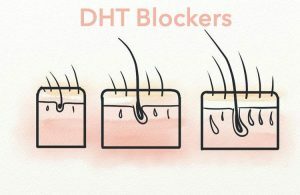 While DHT blockers can help reduce hair loss, they can also reduce sexual function in rare instances, which makes the decision to use them a deeply personal and complicated one. 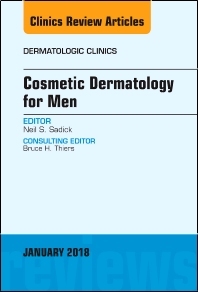 Dihydrotestosterone, or DHT, is a derivative of testosterone that has been scientifically linked to hair loss. Typically, due to genetics or other hormonal changes, hair follicles develop a sensitivity to DHT and begin to miniaturize. This process shortens the hair growth cycle and eventually causes new hair to stop growing. As such, individuals with elevated DHT levels may be more prone to hair loss. Reducing DHT levels is what makes Propecia, one of the most popular pharmaceutical hair loss treatments, so effective. 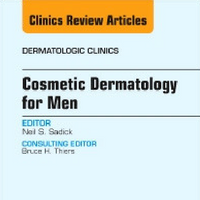 Some studies have shown that Propecia can reduce DHT levels by as much as 70%. 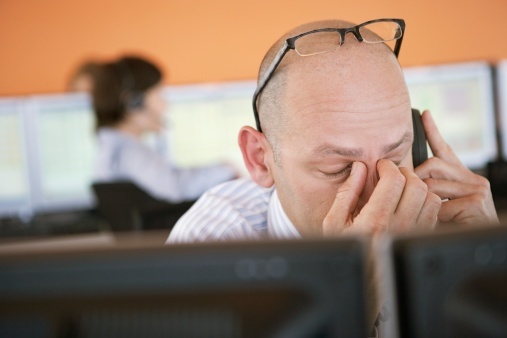 What is the Problem With Reducing DHT Levels? Additionally, since DHT blockers like Propecia affect the body’s hormone system, they should not be handled by pregnant women or women who may become pregnant as it may increase the risk of birth defects in male babies. How Common are the Side Effects of DHT Blockers? The good news is that that these side effects only appear in a small minority of men (about one out of every hundred) who use DHT blockers such as Propecia. If any issues do develop with sexual functioning, they are almost always temporary and will return to normal after discontinuing the drug. At the Hair Transplant Institute of Miami, we evaluate each hair loss patient with a comprehensive and proven methodology, obtaining a detailed medical history, performing an in-depth scalp examination using state-of-the art diagnostic tools and, if indicated, blood tests to detect any underlying imbalances or deficiencies that may be contributing to the hair loss problem. With this information, we can determine the cause of hair loss and the most effective treatment option, whether it be medication, hair transplant surgery, or other alternatives. You Need More Vitamin D. So Does Your Hair. Vitamin D is a critical nutrient. It bolsters our immune system and wards off illness. It is vital for bone health. Some research suggests that insufficient amounts of vitamin D contribute to depression, heart disease, and cancer. Vitamin D also plays an important role in the strength and growth of hair, and a lack of this nutrient has been linked to alopecia, also known as spot baldness. Our primary source of vitamin D is the sun (which is why it is sometimes referred to as the “sunshine vitamin”). 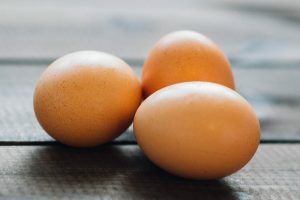 We can also get vitamin D from foods rich in the nutrient, such as fish, fish liver oil, eggs, and dairy, as well as through supplements. The key to resilient, strong hair less prone to falling out lies in the follicles. When hair follicles become traumatized, damaged, or otherwise inactive, the growth of new hair stops and pattern baldness begins. Research suggests that vitamin D, along with the receptors in the skin that bind to the nutrient, plays a significant role in promoting healthy follicles and hair growth while a lack of the vitamin may lead directly to hair loss. A 2014 study published in Molecular Endocrinology found that hair regrew in mice two weeks after introducing vitamin D receptors. Other studies also have made the connection between hair loss and vitamin D.
While we are not yet at the point where we have developed a Vitamin D-based “cure” for baldness, we are definitely at the point where we can say that healthy levels of vitamin D help promote the strength of your hair and reduce the chances of significant hair loss. Make sure you consult with your physician before making any significant changes to your diet or your vitamin D levels, as too much vitamin D can create other health problems, such as calcium accumulation in the blood which may cause weakness or problems with the kidneys. Whether as an adjunct to hair restoration treatments or just as part of a healthy lifestyle, a balanced diet rich in key nutrients such as vitamin D can help boost hair growth in addition to improving your overall health and sense of well-being. Of course, dietary improvements alone may not stop hair loss or restore your hair to the fullness it once had. At the Hair Transplant Institute of Miami, our skilled physicians diagnose and treat hair loss cases that can’t be reversed at home. Through advanced hair restoration surgery techniques and alternative non-invasive treatments, we can help patients suffering from hair loss. • Selection of hair transplantation methodology depends on patient’s goals, type of hair loss, and quality of hair. • Robotic hair transplantation is the latest frontier in hair restoration. • Platelet-rich plasma, low-level laser therapy, and stem cells can be used together with hair transplantation to enhance graft survival. Our bodies are finely-tuned, intricate machines. Like all machines, they need regular maintenance and occasional repair. Stem cells are the all-purpose handymen of our bodies, available to help restore healthy functioning throughout, including the hair and scalp. Full heads of hair are the result of hair follicles which are constantly regenerating, due in part to the presence of stem cells. But when those stem cells shrink and deteriorate as we age, hair stops renewing and ultimately falls out. That’s why reintroducing an individual’s own stem cell back to the follicles has the potential to create a nourishing environment which may foster regrowth and fight the battle against hair loss. That is why stem cell therapy for hair loss has become an increasingly popular treatment. 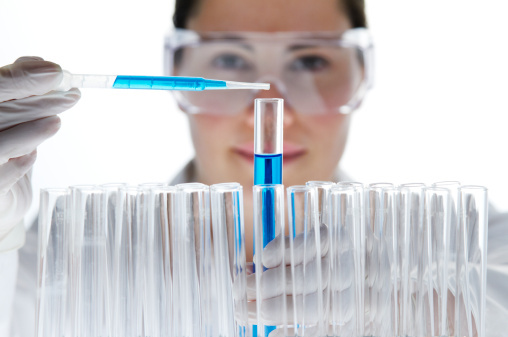 What Does Stem Cell Treatment for Hair Loss Involve? Safe and effective, the minimally invasive stem cell procedure involves isolating a few ounces of adult stem cells from fat in the abdomen, flanks, or love handles and reintroducing them to the scalp. Those fat cells are removed from the midsection using a “mini” liposuction procedure. Prior to this approximately 20-minute-long outpatient procedure, a mild oral sedative and local anesthesia is administered, minimizing any pain or discomfort. Following the liposuction, the medical professionals performing the procedure will isolate the stem cells while you rest. 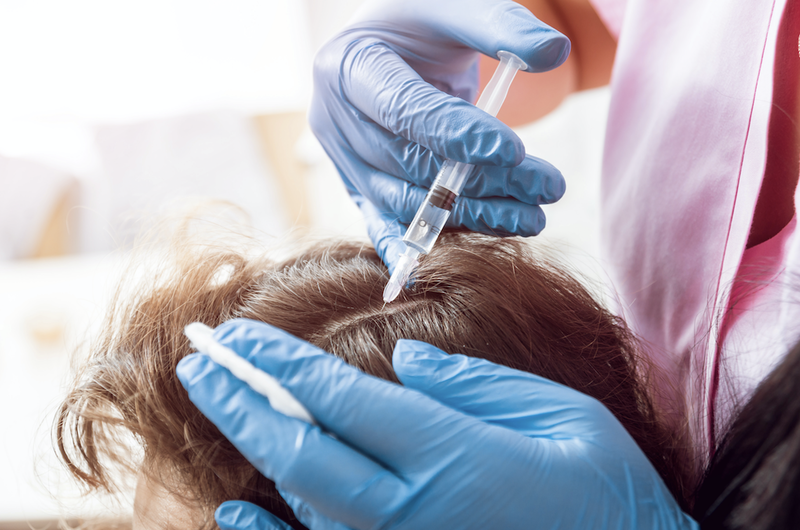 Once isolated, they will then be injected into targeted areas of the scalp, where they will begin their work stimulating hair growth. The whole treatment process should last approximately three hours. As an outpatient procedure, you will be able to go home shortly thereafter. However, since you will have been under mild sedation, you should arrange for someone else to drive you home. While you may experience some mild soreness after the procedure, you should be able to go back to work the next day. 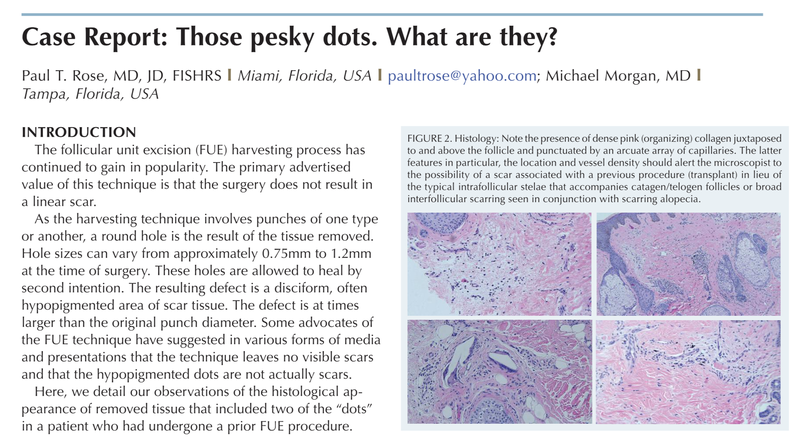 It may take a few months before you notice any results, and as this is a relatively new procedure, it is not yet clear how long results will last. However, the team at the Hair Transplant Institute of Miami is optimistic of long-term hair regrowth potential, particularly with ongoing treatment. Stem cell treatment can be used in conjunction with hair transplant surgery, platelet-rich plasma (PRP) injections, topical treatments or low-level laser therapy (LLLT) to increase your odds of success. 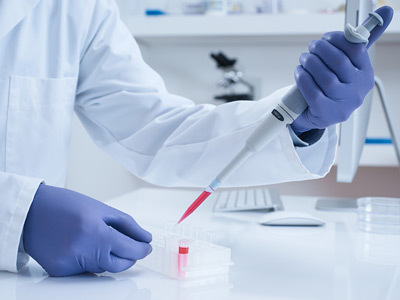 To consult with Dr. Bernard Nusbaum and Dr. Paul Rose about whether Miami stem cell treatment may be right for you, call our office at 305-925-0222 or contact us online to book your appointment. While male pattern baldness affects most older men, research on genetic predisposition to baldness has been minimal – until now. In a recent study published in the journal PLOS Genetics, a Scottish research team from the University of Edinburgh found nearly 300 genetic ties to hair loss, helping identify potential chromosomal markers of male pattern baldness. The study analyzed over 52,000 male participants between the ages of 40 and 69-years-old. 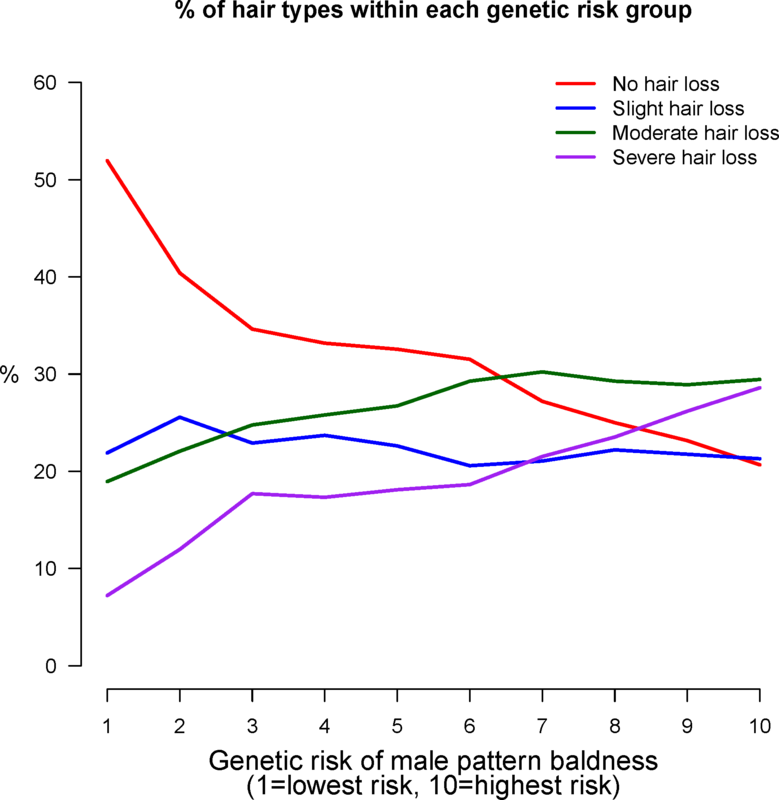 This is the largest genetic report on male pattern baldness to date. Based on the genetic variants between a discovery sample (40,000 subjects) and a target sample (12,000 subjects) that distinguished patients with no hair loss and severe hair loss, the team developed an algorithm to forecast who may develop male pattern baldness. The higher the patients genetic (polygenic) score, the more likely they were to suffer from male pattern baldness. Among participants with a sub-median score, 14 percent showed severe hair loss while 39 percent had no hair loss. Meanwhile, 58 percent of patients who scored within the top 10 percent showed moderate-to-severe hair loss. For the most part, the genes identified are associated with hair structure and development. These findings could support early diagnosis and better treatment of male pattern baldness in the future. As noted in the report, male pattern baldness affects approximately 80 percent of men by age 80. Balding can lead to substantial emotional issues, including diminished self-confidence, social isolation and depression. Past research has also linked baldness to an increased risk of prostate cancer and cardiovascular disease. Can Stem Cells Treat Hair Loss? Thanks to stem cells, hair follicles are constantly regenerating. When they stop renewing, hair loss ensues. In the effort to target hair loss at the root, research shows that re-introducing a patient’s own stem cells to the follicle creates a nourishing environment to foster regrowth and fight the battle against hair loss. In addition to hormonal changes associated with androgenetic alopecia, stem cells begin to shrink and deteriorate as we age. Per a recent Japanese study¹, stem cells that help promote hair renewal begin to wear and tear overtime, limiting the potential for follicle restoration. In addition, the follicles face miniaturization or shrinkage, making it difficult for new hair to grow. Aside from getting older, sun damage and chemical exposure can expedite stem cell damage. The minimally invasive stem cell procedure involves a mild oral sedative and local anesthesia, making the process quick with little discomfort. Using a liposuction tool, we derive fat cells from the belly, flanks or love handles and extract the stem cells that will later foster hair growth. We then inject this concentrated stem cell sample onto the scalp. Although stem cell treatment for hair growth is a relatively new procedure, the team at the Hair Transplant Institute of Miami is optimistic of long-term hair regrowth potential, particularly with ongoing treatment. Stem cell treatment can be used in conjunction with hair transplant surgery, platelet-rich plasma (PRP) injections, topical treatments or low-level laser therapy (LLLT) to increase your odds of success. To consult with Dr. Bernard Nusbaum and Dr. Paul Rose for Miami stem cell treatment, call our office at 305-925-0222 or book your appointment using our online form. For non-Miami residents, we partner with area hotels to minimize lodging costs for our patients. To receive an exclusive Miami hotel discount, contact us after scheduling your procedure for a corporate rate code.